The Preimplantation Genetic Diagnosis (PGD) is a new method of Prenatal Diagnosis. The aim of this study is to increase the chances of having a healthy baby and therefore, avoiding the chances of transmitting a genetic or hereditary disease. In order to perform the diagnosis we use high technology with each embryo. What does Preimplantation Genetic Diagnosis involve? 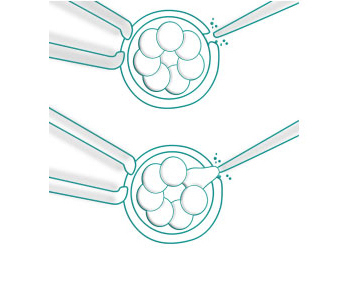 This technique allows us to perform a genetic screening of the embryos obtained during the In Vitro Fertilization process, thereby detecting possible chromosomal or genetic disorders before the embryos are transferred into the uterus. To perform a PGD, our biologists extract one of the 6-8 cells of the embryo and perform a biopsy. After the biopsy, the embryo is incubated in a culture medium which provides the adequate environmental conditions for its development until it is transferred into the uterus. The cell obtained during the biopsy is genetically screened in order to check if the embryo carries a chromosomal or genetic disease. The remaining cells of the embryo are genetically identical to the analysed cell and continue to develop in the incubator. The day after the removal or the embryonic cell, we can know which embryos have no genetic disorders and can be transferred into the patient's uterus. When do we recommend Preimplantation Genetic Diagnosis? Preimplantation Genetic Diagnosis is recommended for those couples who are carriers or suffer from genetic or chromosomal diseases that are transmissible to their offspring. It is also recommended for women of an advanced age, for women who have had repeated miscarriages, for patients undergoing fertility treatments who have failed several times to conceive through In Vitro Fertilization and finally for those couples who produce embryos with morphological alterations.